You can reach the resort on your own in a vehicle or on your motorbike. Below are directions in text, and also using Google Maps. 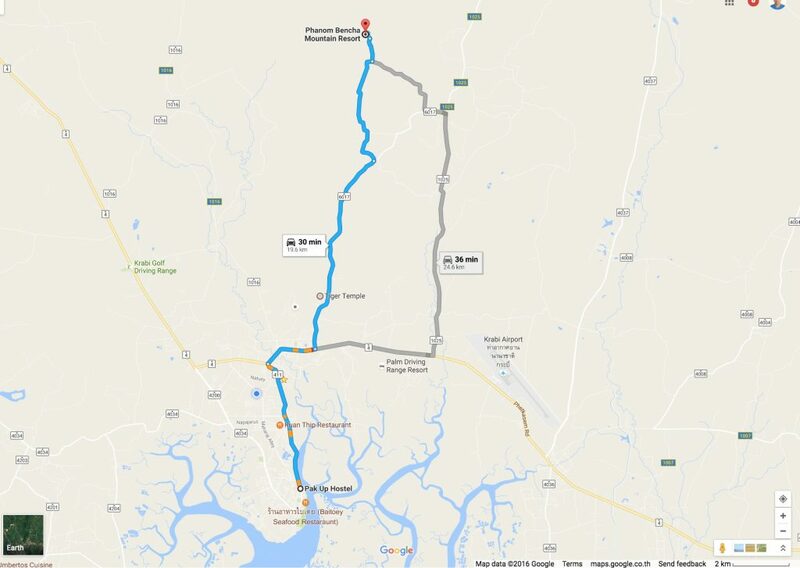 Or, just call “Son” at 081.089.6135 to have a truck or other vehicle pick you up and take you (around 600 THB). From Pak Up Hostel on the river, and on the corner of Chao Fa Road – go down the hill toward the police box, with the river on your right side. 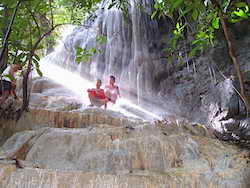 Go past the Krabi Hospital on your left side about 1 km from Pak Up Hostel. Continue down that road, and there are 2 stop lights you go straight through, and then a large intersection called “Talod Gaew” where you cannot go straight. Turn RIGHT. Now you are on Highway 4. This road leads to the Krabi Airport, but you don’t take it that far. At the 2nd stoplight make a LEFT. This is now taking you toward Tiger Cave Temple (Wat Tham Seua). You go down this road about 13 km, past Tiger Cave Temple. There should be towering limestone mountains on your left. 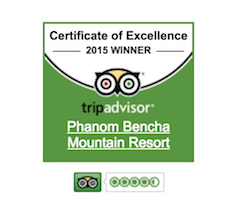 Watch for white signs announcing “Phanom Bencha Mountain Resort” on your left side. There is a sign right before a LEFT hand turn you need to make. After you make that turn, it is a pot-hole filled road which goes through villages and past goat farms (You’ll smell them), and the road seems to lead straight into a small store, but bends right and then you will make a LEFT TURN. There is an OLD RUSTED SIGN THERE, and hard to see, but it’s there – for our resort. On that small road you will go about 500 meters and there is another sign for our resort after climbing a very small hill – and another LEFT TURN onto a dirt road. 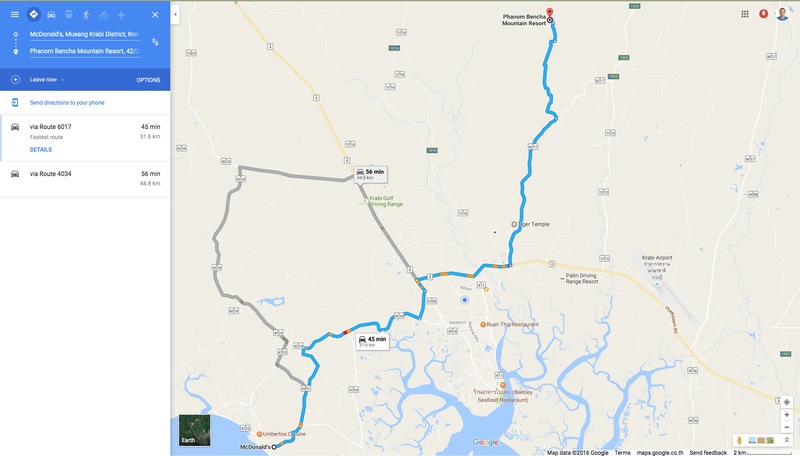 Follow that dirt road to the left – and through high rubber trees – and we are at the end of it on the left! 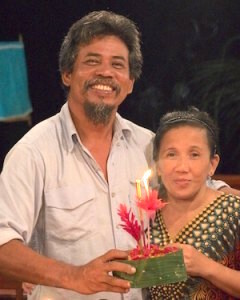 If you are lost – call SON, the manager of the resort at 081.089-6135 and he can try to direct you. From McDonald’s go up the hill (McDonalds on your left). Go until the road stops at an intersection where you must make a left or right. Make a RIGHT TURN. Go until that road ends at an intersection with another road. Make a RIGHT TURN. Go until that road ends at an intersection at the top of a small hill with traffic lights. Make a LEFT TURN. Go until that road goes down a hill toward a traffic light. Make a RIGHT TURN at that traffic light. You will climb a long hill, go down a hill, go through some traffic lights. At the 4th Traffic Light you will make a LEFT TURN. This is the road leading to Tiger Cave Temple (Wat Tham Seua). From here, look at instructions above starting with #3, and follow #3 to #8. Click THIS LINK and see if it works for you – this will make it easier. If it works – GREAT. 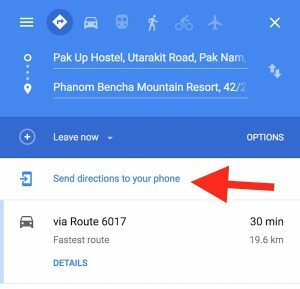 This will show you directions in Google Maps from Pak Up Hostel by the River in Krabi Town, directly to our resort. Hopefully you can put that into your phone or other internet abled device and find us rather easily! If the link above did not work, go to Google Maps HERE. In the upper left side click the button that looks like this: Then for directions to and from choose… FROM: “Pak Up Hostel, Krabi Town, Thailand” and TO: “Phanom Bencha Mountain Resort, Krabi, Thailand”. (No real detail, but just so you can see an overview). 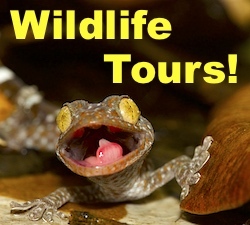 Don't Miss Our Night Time Wildlife Tour! Welcome to Krabi’s Wilderness Resort – Phanom Bencha Mountain Resort!